Experience the Center at its best with your family. Our Family Membership is a wonderful way to bring your family together to enjoy all that the Center has to offer throughout the year. Membership covers a household of six (two adult cardholders and up to 4 guests). One FREE scheduled Docent-led Tour in Sausalito for two named cardholders and up to 4 guests. Discounted Audio Tours for two named cardholders and up to 4 guests. 10% discount on purchases at our Gift Shop and our online store. 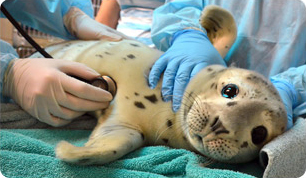 The satisfaction that you're giving marine mammals a second chance at life. Join now or renew your existing membership by simply clicking the buttons below and completing the online donation form. For general membership inquiries, contact our membership team at members@tmmc.org or call (415) 289-7335.